Callie Johnson (center) and the cast of Bailiwick Chicago’s Chicago premiere of CARRIE: The Musical with music by Michael Gore, lyrics by Dean Pitchford, book by Lawrence D. Cohen, based on the novel by Stephen King, directed by Michael Driscoll and music direction by Aaron Benham. Photo by Michael Brosilow. Forget for a moment that “Carrie: The Musical” is based on Stephen King’s terrifying debut novel and the subsequent iconic 1976 Brian De Palma film. And I know it will be exceptionally hard, but also forget that the show is a much-revised version of the cult-classic, infamous 1988 Broadway flop (thankfully, the book has exorcised most –if not all-of the demons that initially made the show a campy, miserable failure). 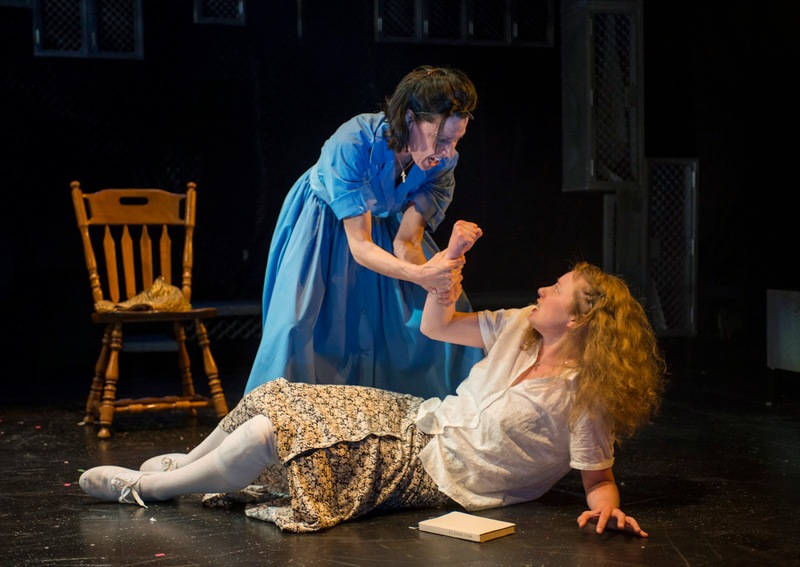 “Carrie: The Musical,” enjoying its Chicago premiere at Bailiwick Chicago at Victory Gardens through July 12, soars like a phoenix on the strength of the performances of its leading ladies and a terrific ensemble cast. If you’re looking for camp, look elsewhere. This is a serious and somber tragedy t electrifies. 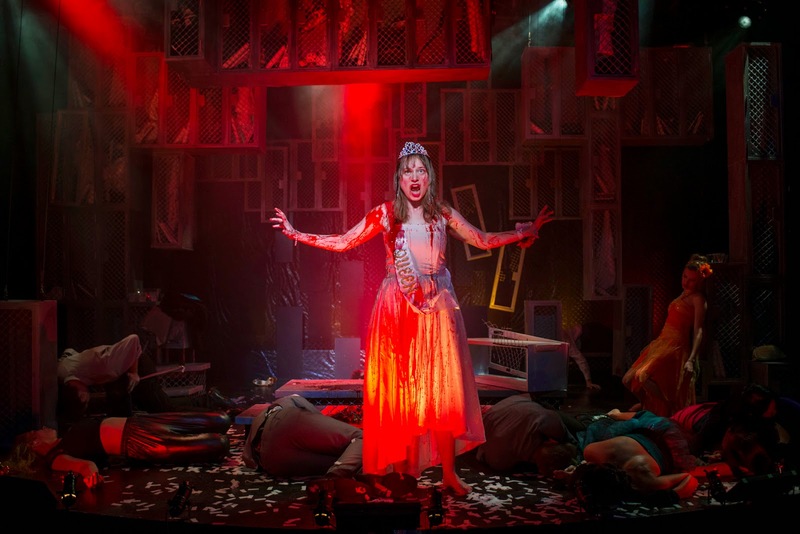 As seen with the Bailiwick production, “Carrie” deserves to be rescued from the pile of shows whose Broadway dreams did not pan out. Aside from merely being entertaining, any revival (even revivals of failed musicals) needs to have some cultural, political or social relevance to the era in which it is being produced. “Carrie” is no different and she comes bearing quite a message. In 1955’s “Rebel Without a Cause,” it was teens rebelling against society. In the musical “Carrie” (book by Lawrence D. Cohen who also wrote the film script; lyrics and music by Academy Award winners Dean Pitchford and Michael Gore, respectively) teens have become society and now battle each other with tragic results. 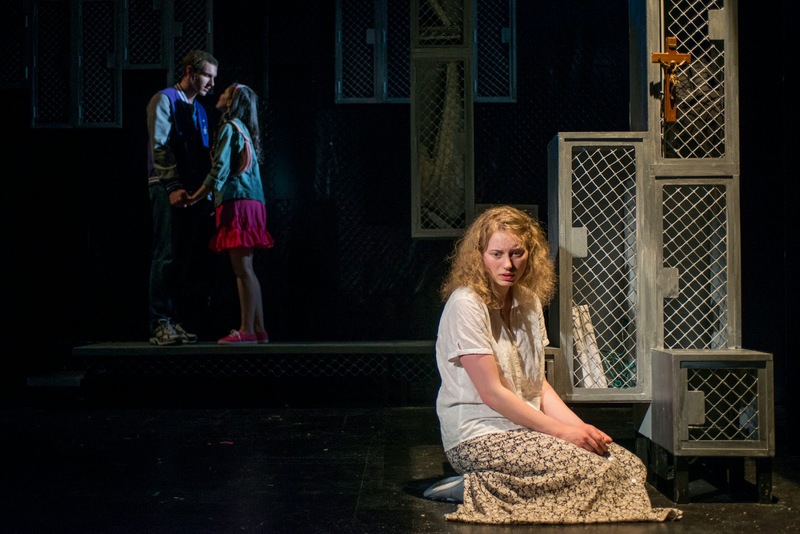 Henry McGinniss, Rochelle Therrien as Tommy and Sue (background, left to right) and Callie Johnson as Carrie (front) Photo by Michael Brosilow. It’s hardly earth-shattering news, but, yes, teenagers, in their effort for peer acceptance, will often turn on anyone and everyone who is different quicker than you can grab your copy of Lord of the Flies. As the tortured Cinderella of the piece, Callie Johnson initially sings of bringing her fellow classmates down to their knees in the title song, and yet Johnson manages to illicit our sympathies. The song (and Johnson’s performance of it) shows us the seed of rage that will be the source of her powers later on. For the most part, she just wants to fit in like everyone else and dreams of dancing, laughing more than she does. Katherine L. Condit (left) and Callie Johnson. Photo by Michael Brosilow. Michael Driscoll’s direction keeps things moving along with an energy that pulses from the first number to the last. Brigitte Ditmars’ choreography has the required youthful vitality, particularly in the group numbers. Stephen H. Carmody’s sterile and industrial set, with suspended metal lockers and chain link fencing evokes a sense of imprisonment more than it does high learning. To some teens, that’s the point, though. If you’ve read the book or seen the movie, you know how things must end. To Johnson’s credit, you heart still breaks for Carrie as those events play out, though. I found myself wishing Carrie could have her happy ending this time. "Carrie: The Musical" runs through July 12 at the Victory Gardens Richard Christiansen Theater, 2433 N. Lincoln. Tickets, $40. (773) 871-3000. bailiwickchicago.org.